On Monday and Tuesday, I kept the cell phone tuned to DX Summit to keep tabs on K2B, K2C and K2F to see if they would ever make their way over to 40 or 80 Meter CW. They may have, but not at times that coincided when I checked. In the meantime, I kept busy both days doing some serious bushwhacking. I don't know what it is about the soil in South Plainfield, but if you don't constantly keep at the weeds and brush, it turns into a jungle. 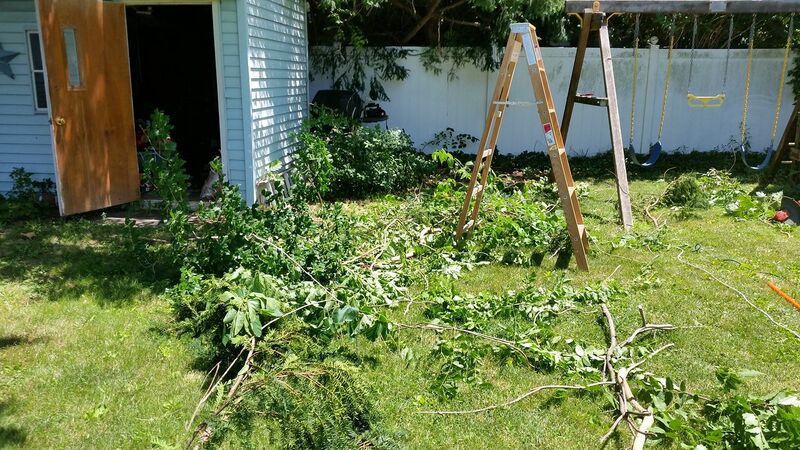 I spent both days pulling weeds from my yard and cutting back vines and overgrowth from my neighbor's yards that had been encroaching into mine. I also had a serious war with some mulberry bushes that started growing along the chain link fence along one side of the yard. Mulberry bushes are hardy and huge and grow like weeds. The berries are actually pretty sweet and make great pies; but when they grow in an inconvenient place, they just become an eyesore. The ulterior motive behind this, in addition to keeping the backyard looking neat and well groomed, was to clear the path for replacing the coax to the HF9V. That will get done in a few weeks, when the first Saturday opportunity comes up. The next few weekends will be otherwise occupied; but I think I will be able to get it done before August begins. Technically, there was enough time to get it done yesterday, but alas, W2LJ is not a Spring chicken any longer. I was too tired out by the two day effort to want to bother messing with routing RG-213. Besides, this time I have a plan to keep it elevated above ground, so that there will no longer be potential for lawn mower "accidents". I have some garden fence stakes that I am going to pound into the ground at regular intervals along the back white fence, and I will cable tie the coax to them so it becomes elevated. Once the coax reaches the side perimeter chain link fence, I can just cable tie it to the horizontal top rail and can pretty much run it all the way to the shack. It will lay on the ground for about the last 20 feet or so before actually entering the house; but it will be so close to the foundation that it will almost be impossible to nick it with the lawn mower. I plan to also re-purpose the 80 Meter coaxial stub that I made for Field Day as new feed line for the W3EDP antenna. Sounds like some of the duties of vertical antenna maintenance at my wth. Using a Hustler 6btv with 28ft radials under it. It does well.